When it comes to serving a lunch, serving soup & sandwiches to any size group, serving a dinner to any size group or a tea, we always need to know how much to purchase and prepare. If it is served by the plate, buffet style or family style will also make a difference. CAREFREE CATERING tells you how much to prepare for 30 to 400 people with over 150 recipes that are great for any of these events. Every kitchen or banquet hall should have a copy of this book so that your serving experience will be relaxing and enjoyable. During those lean years when Winnie was busy at home helping with the farming and caring for their five sons, she began to cook and bake a little extra for others. She soon turned her joy of cooking into a small catering business that successfully provided money for their family needs. 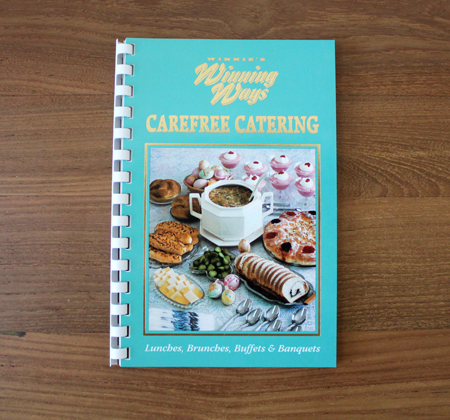 For many great delicious yet healthy recipes as well as a complete guide to the amounts needed for 20 to 400 guests, order Carefree Catering.